I’ve finally finished off the modifications to my re-worked Daphon E20OD pedal. With the rehousing of it I wanted to give it a new look and name. Seeing as the Daphon E20OD is essentially a reworking of the Boss SD-1 Super Overdrive with a Ibanez Tube Screamer chip, and because I had added in the switch to go between symmetrical and asymmetrical clipping, and modified the circuit to be a little closer to a Tube Screamer one I felt I had to acknowledge these things. I ended up Christening it the “Green Envy”. The artwork I found on Deviant Art (by xcrystalcorex – hope you don’t mind me using this for personal work), and I felt that it sat nicely with the name I came up with. The way I did the artwork was by printing the imagery on some photo paper, cut it out, and glued it to the top of the pedal. This wasn’t my preferred way of doing this. I wanted to use some adhesive photo paper to make it easier to stick the the pedal and it’s curved edges, but couldn’t find any today. I then sprayed a light coat of clear coat to help stick the image to the pedal. This would have worked a lot better had I used the adhesive paper, but it will do for my first attempt. The E20OD came with a PCB mounted AC jack, but I wasn’t able to give it external access very easily. I decided to install a new jack on the side of the pedal. 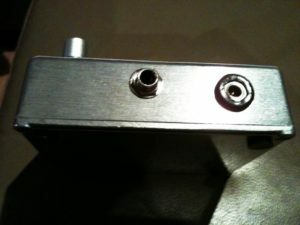 The jack I had bought at my local electronics store was a metal cased one, and I realised afterwards that I would have to ensure that the jack was not installed with metal to metal contact, as the standard AC jack arrangement on most pedals these days is the Boss standard with the tip as negative. I bought some rubber grommets to install the jack to get around this. To make the installation simple I left the stock PCB-mounted jack alone, and wired up a 9V battery clip to the jack, with what is normally the positive wire to the tip, and negative to the sleeve. This is so I could plug the clip onto the pedals batter clip, and match up the polarities correctly. This worked nicely, and meant that I could use AC power, or hook up a battery if I felt the need to. Building this customised pedal has been an extremely rewarding experience. 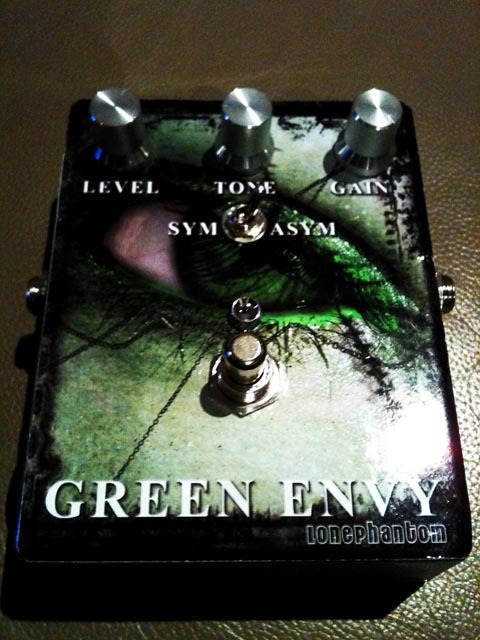 I would love to make a few other changes to the Green Envy, like add a true-bypass switch, and maybe quiet down the pedal a little more, but that will be extremely difficult considering how packed the enclosure is right now, and my limited skills. I’m planning to build a pedal from scratch next. I’m looking a building an Electro-Harmonix LPB-1 on perfboard, so hopefully that will go well. One Response to "Modding the Daphon E20OD – part 2"